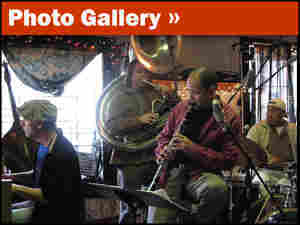 Danza Quartet Welcomes 2009, Bayou Style On New Year's Eve in New Orleans, the Evan Christopher/Tom McDermott Danza Quartet held sway with a set of music that was anything but picayune. With a sousaphone-toting bassist and a tambourine-banging drummer, the quartet made the show an affair to remember. "When My Dreamboat Comes Home"
New Year's Eve in New Orleans was an affair to remember. The moon waxed over the Crescent City like a sliver over the Mississippi River, a cradle in the sky over the cradle of jazz. The lighted entrance of Louis Armstrong Park was shining on Rampart Street for the first time since Hurricane Katrina dimmed the neighborhood, and historic Congo Square was just a heartbeat away from us. Donna's Bar & Grill, a corner-pocket club on the edge of the French Quarter, is one of the city's real joints, and it was packed with appreciative locals. Chef Charlie Sims cooked fried chicken, lasagna and the region's traditional New Year's dishes of black-eyed peas and cabbage. Onstage, the Evan Christopher/Tom McDermott Danza Quartet held sway with a set of music that was anything but picayune. Christopher's creole clarinet shouted with exuberant joy in "The Broken Windmill" and "Swing That Music," from two of New Orleans' iconic jazz figures, Sidney Bechet and Louis Armstrong, while his throaty smears transported us to the red lights of Storyville in Jelly Roll Morton's "Buddy Bolden's Blues." McDermott banged a schoolhouse Everett spinet piano (with a recently revived low A key) into submission in another Morton classic, "Grandpa's Spells." We heard the full range of "le monde creole" that night — early jazz, a classical danza from Creole composer Louis Moreau Gottschalk. The set included a mélange of calypso, cakewalk and Brazilian choro (McDermott's "Casa Denise"), as well as the gypsy lilt of Django Reinhardt's "Douce Ambiance," not to mention plenty of natural ambiance from an enthusiastic audience. Minutes before midnight, the quartet built the anticipation into a fervor with "Thursday Morning Revival" from bassist and sousaphonist Matt Perrine. After the countdown, both Thursday morning and 2009 had arrived, and the Danza Quartet launched into a rumba-heavy "Auld Lang Syne" that would make the legendary pianist Professor Longhair wiggle with approval. Depending on the call, Perrine's bass strings and brass valves either anchored the deep bottom line or paraded the carnival second line. Drummer Shannon Powell represented the city's Treme neighborhood with a panoply of rhythm and a kick drum that bumped the metered funk of Zigaboo Modeliste, the early stomp of Baby Dodds and the bamboula beat of the Caribbean. Hope sprung eternal at Donna's, and the crowd seemed to be on the cusp of more than just another year. The word "reconstruction" carries a negative connotation, making the term "rejuvenation" a more appropriate description for our night in New Orleans. A good time was had by all, but the hard work of staging a comeback continues into 2009.